If you're a stiff, tight and sore yoga student, YOGABODY®'s Stretch formula was designed just for you. Modern yoga students put their bodies under tremendous strain as they work to build both strength and flexibility in their soft tissues. During your personal transformation, nutritional support is absolutely essential. Buy 2 Get 1 Free! Free Shipping! YOGABODY® Stretch (Fleximine) has been added successfully to your wishlist. If you're a stiff, tight and sore yoga student, YOGABODY®'s Stretch formula was designed just for you. Modern yoga students put their bodies under tremendous strain as they work to build both strength and flexibility in their soft tissues. During your personal transformation, nutritional support is absolutely essential. Since 2007, YOGABODY® Stretch has been the preferred formula for yoga teachers and students in 81 countries. A whole-food, superfood, and micro-mineral-dense blend, YOGABODY® Stretch is designed specifically to meet the nutritional needs of bendy-bodied students everywhere. 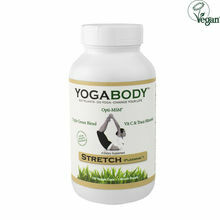 With YOGABODY® Stretch, you can take one supplement to get all of your supportive yoga nutrients with maximum purity and 60% cost savings (if you were to buy all these ingredients separately). BENEFITS: MSM acts as a powerful antioxidant and healing source of natural sulfur. For stretching students, MSM has been shown to relieve inflammation and reduce recovery time. Buffered Vitamin C, when combined with MSM, has been shown to aid in the health of connective tissues. This formula uses Vit C buffered with magnesium to ease digestion. Spirulina (fresh water algae) delivers a whopping dose of B vitamins, Iron, and the essential fat, GLA. Chlorella (also s fresh water algae) is packed with chlorophyll, also known as “the blood of plants.” Barley Grass Juice Extract is the ultimate green food, is excellent for stretching students because of its high levels of beta-carotene, calcium, and iron. I’ve been through a lot. I’ve had surgery and years of therapy on my shoulders back and hips. Really NONE of it helps. I get results, but I absolutely get the most gruesomely slow progress. With these pills, I have sincerely noticed increase recovery time, less inflammation and increase in flexibility. If it weren’t for these pills, I probably wouldn’t be sitting down right now because of my severe back pain because it helps my joints. It’s really incredible. Easily the best product out there. It’s not a cover of up of injury or anything. It’s a direct healing natural pill and I love that It really helps me. I do still have problems, but only because my condition is very severe from over exercise, but regardless it’s amazing. I am not a yoga student, just a 63 year old that looks like he’s in good shape but had no idea how stiff he was. After only 4 days I can’t believe the difference not only in my body but my sense of well being and renewed attraction to my lovely wife (She is stretching as well). Hip pain that I have had for years and thought was something major is almost gone. Probably just stiff muscles. My body feels so erect and light. Can’t wait to feel what happens down the road. Oh, did I mention my renewed attraction to my beautiful wife? Thanks for what you do.